When he was a young man in Italy, my dad and his family risked their own safety to help protect the lives of three American POWs who had escaped confinement during the tail end of World War II. This led to a commendation by the U.S. government and a series of intricate events over two decades and across three continents that ultimately landed my father in the United States and hence placed me here, today, in front of my computer writing this column. I bring this up because we never know how the choices we make will affect our lives one day and others’ the next. On the other hand, sometimes our choices are part of a long-term plan. Jim McKeown, for example, whom we profile in this month’s One-on-One column, is a Columbia University engineer turned investment banker turned humanitarian. He co-founded a not-for-profit organization in South Africa called Masinyusane—which is isiXhosa for “let us raise each other up”—aimed at educating children in slums so that they can help themselves escape the cycle of poverty and improve their lives. According to McKeown, he made conscious choices at Columbia that led him to a high-paying job and then to the city of Port Elizabeth and to his current work. The more informed we are about the choices that lie in front of us in life, the better we are able to control the consequences of those decisions, even if we don’t know what the future holds. It doesn’t always work that way, that’s for sure. But the odds get better when we talk about engineering and science—generally, the more that is known, the lower the risk of failure. Engineering relies on sophisticated tools to reduce the subjective human element so that processes can be replicated with fewest failures. 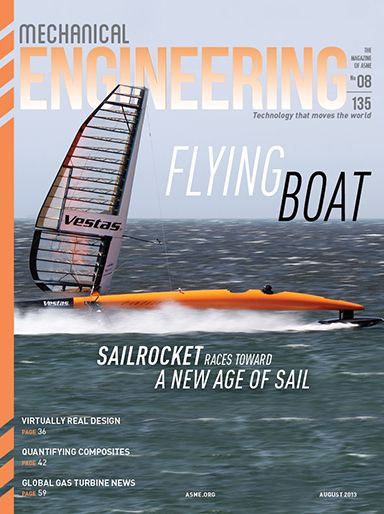 In her article, “Reach Out and Touch,” in this issue, ASME Fellow Judy Vance predicts that, one day, virtual reality tools will play a dependable role for all engineers. She says that when that day arrives better products will be produced at lower costs because today’s still burgeoning technology will bolster the decision-making process. Tools help of course, but much like human behavior, engineering and science are multifarious. “Because science is increasingly complex and compartmentalized, it is increasingly difficult for an average person to understand, even if one is motivated to do so,” said G. Wayne Clough, the Secretary of the Smithsonian Institution, at ASME’s Annual Meeting, where he was recognized as the 2013 recipient of the prestigious Ralph Coats Roe award. Clough, along with the many others who are pushing hard to enhance the engineering and scientific knowledge base in K-12 and beyond, understands well that the more we know today, the better qualified we become to make the right choices for a better tomorrow. As for my father, he was fortunate to live long enough to see the impact of his decisions on his family.